Before I begin the review, gonna do another cheap plug and ask you check out a build-up video I made for the show, and to sub to my YouTube channel, TheRichStaple. Hope to get more WWE content on there soon, so stay tuned! We know you guys aren’t on the main card, but here’s a consolation prize. Good, but not what I wanted. You could tell from the moment the bell rang, both Alexander and Ali were excited to be there. It’s like they were trying so hard to contain their excitement and just went out there like little kids in the ice cream shop. Now, unfortunately, this wasn’t the match I was expecting. Don’t get me wrong, the match was very good. Both men got their offense in, there was plenty of back and forth and high spots and the story was good. Nothing was wrong with the match from a mat perspective, but I wasn’t a fan of the pacing. I always hate it when the Cruiserweights wrestle like the main roster. What’s supposed to separate the Cruiserweights from the main roster is their up-tempo, high-flying acrobatics. And I didn’t get to see that here. There was Mustafa Ali carrying things along in that regard, but it still felt like two heavyweights fighting on RAW. Considering how awesome the Cruiserweight tournament has been, and some of the quality matches 205 Live has been delivering as of late, am I wrong to say I felt kind of….wanting? It’s like I just kept waiting for the match to hit that fever pitch where both men would be flipping out everywhere and stuff, and it never came. Can we please render all future battle royals as obsolete? What a mess this was. I understand that WWE wants to get as many superstars as it can on the card so no one feels left out, but these battle royals serve nothing more than to say, “Hey, we know you don’t have your own WrestleMania match on the card, but at least you’ll be there. 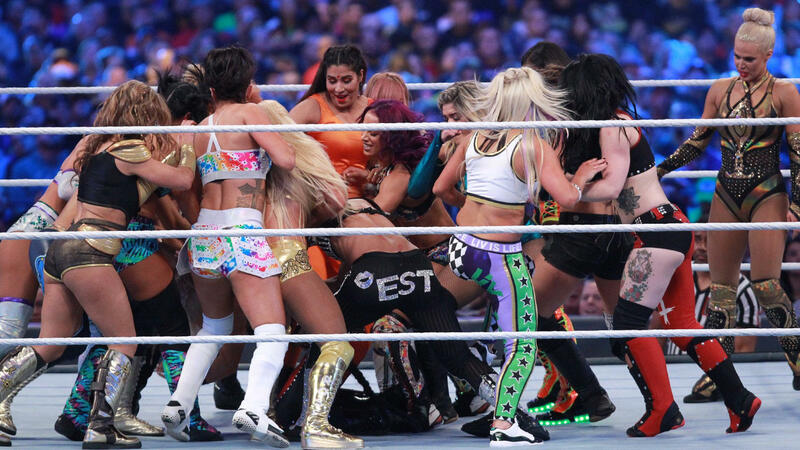 It’s the thought that counts, right?” Honestly, this match really just had no flow, and what was even worse was how WWE is trying to push this, “1st ever Woman’s Battle Royal” narrative. It’s like WWE is trying to reach for everything to make it seem like a historic occasion. 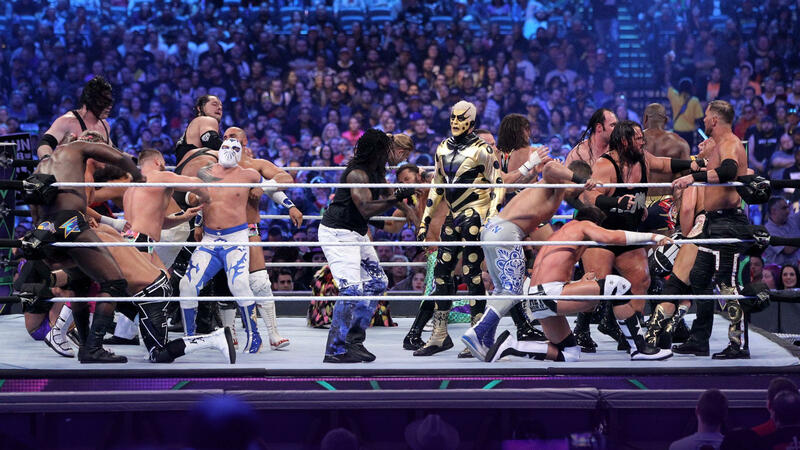 This is how you start WrestleMania, dammit. I’m sure we all knew that this was going to be the match to open the card, because Rollins, Miz, and Balor are three of the top workhorses in WWE, and the three have unbelievable chemistry with each other. And what an opener this was. Before I get into the nitty-gritty, can I just saw how much I adored Seth Rollins’ entrance as White Walker? I think we all knew from the moment he entered, he’d be winning the title. The reason why I picked Rollins to win the match was that he was the one who was carrying the most momentum into WrestleMania, and while normally that would signify a loss at WrestleMania the week before, I believed that WWE was going to capitalize on his momentum. In addition, you can always just put the title back on The Miz because he’s done it 8 times already, and he’ll probably do it again to break Pedro’s record. Meanwhile, Finn Balor was an excellent third piece, though I’m inclined to believe that we are going to have the first ever “Slingblade” match at WrestleMania with how many we’ve seen from him.